The Codex Calixtinus–or Liber Sancti Jacobi / Book of Saint James–, a jewel in medieval bibliography, is one of the richest medieval sources for historians, geographers, musicologists, sociologists, ethnologists, art historians and linguists. Due to its heterogeneous and composite character, this codex is believed to be the work of several authors and compilers. It is known as Codex Calixtinus not because this Pope had been one of its authors but on account of the extraordinary influence that he, his secretary and the people of Cluny had in the gestation of the work. Before his election as Pope in 1119, Calixtus II had been the Abbot at Cluny; the people of this Burgundian city had originated and promoted the pilgrimages to Santiago and, as Pope, Calixtus became the most impassioned benefactor of these crusades. This Pope from Cluny, brother of the Count of Galicia, son in law of King Alfonso VI, raised the status of the city of Santiago to Archdiocese. It has also been established that the French cleric Aymeric Picaud, Secretary of Pope Calixtus, was an important participator in the writing, or at least, compilation of the codex. Scholars believe that the codex was compiled around 1160 and no later than 1173, since at that time a monk by the name of Arnaldo de Monte, a pilgrim in Compostela, made a "copy" of the work for his abbot and brothers of the Ripoll Cloister (MS Ripoll 99, Barcelona, Archivo de la Corona de Aragón). The Jesuit historian P. Fidel Fita rediscovered the codex in 1886; for unknown reasons the book had been hidden and forgotten. In 1964 the entire codex was restored in the workshop of the National Library of Madrid; one of the parts of the codex, Libro IV (Historia Turpini), which had been removed in the 17th century was then reincorporated into the manuscript. Libro I (fols.4-139) contains sermons, liturgical texts and homilies for the liturgy of Saint James (Santiago), including numerous musical chants and two polyphonic settings written specifically for the new liturgy (fols. 101v-139). Book I is preceded by a bizarre and clearly spurious letter from Pope Calixtus (fols.1-3). Libro II (fols.140-155), known as the "Book of Miracles," is a collection of 22 miracles credited to Saint James which had occurred in different areas of Europe. Libro III (fols.156-162) narrates the moving of Saint James' body from Palestina to Compostela. 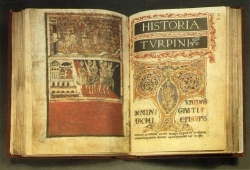 Libro IV (fols.163-191), or Historia Turpini, is a history of Charlemagne and Roland (Historia Karol Magni et Rotholandi). It has been falsely attributed to Turpin, Archbishop of Reims. Although this book was originally a part of the Codex Calixtinus, it was removed in 1620 and circulated widely as an independent unit. Luckily, as just mentioned, the book has now its original place in the codex. Libro V (fols.192-225) is the very famous "Liber Peregrinationis" ("Guide of the Medieval Pilgrim") attributed to Aymeric Picaud. It is considered the oldest touristic guide of Europe. Musical settings (including plainsong and polyphonic conducti, tropes, and organa) follow on fols. 214-222. The codex ends with an appendix which has several poems and hymns related to Santiago. Codex Calixtinus is a marvellous witness to the political, social, cultural, religious, musical and intellectual fabric of the medieval world. "The Guide of the Medieval Pilgrim", offering vivid descriptions of the different towns and people, their customs, habitat, character, organization, lingustic manners, and its unique fusion of franco-hispanic elements, is a beautiful ethnographic lesson. The music in the codex is a topic in itself and offers a wonderful snapshot of the state of music composition in the 12th century: the texts for St. James along with their accompanying monophonic tropes and sequences clearly illustrate how the liturgy was expanded and embellished for a new great feast day. The musical highpoint is its repertoire of polyphony; it includes the first known composition for three voices and serves as a vital bridge for the Notre Dame School. Without this repertoire our understanding of the birth and evolution of polyphony in the western world would be completely distorted. monumental work for medieval studies, will be a basic and treasured tool in your library. with an antique finish; leather slipcase. Limited numbered edition of 845 copies.